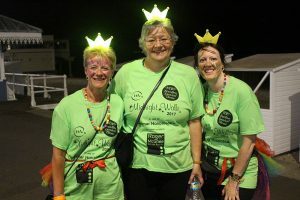 On Saturday 15th July, 600 ladies joined together to walk for Weldmar Hospicecare in Weymouth in their eleventh Midnight Walk. Together, these ladies have raised at least £60,000 for the Dorset based charity – which will help Weldmar continue to provide its outstanding care, supporting patients with end of life needs. The walkers took on one of three routes, starting at Weymouth College at midnight. There was a 5 mile, a 6.5 mile and a 10 mile route – with the last walkers arriving back at base at around 3am. Caroline Hamblett, Chief Executive of Weldmar Hospicecare, took part for the first time since joining the organisation last year – and walked the 10 mile route with a group dressed as Carmen Miranda, to celebrate this year’s Brazilian Carnival theme. Caroline said “Thank you to all who came to our Midnight Walk. It’s been a fantastic evening with a great atmosphere. It’s been so inspirational to see so many people here. Women remembering people; women enjoying themselves. It’s been absolutely wonderful. I just want to say ‘thank you’ to everyone involved this evening – we couldn’t do it without you”. A team of over 100 volunteers helped to make the evening a huge success – and the event was led by Clair Walker, Weldmar’s Major Events Fundraiser. Lastly, I would like to thank each and every lady that came tonight, and helped to raise such a huge amount of money. We rely so much on the support of our local community. The money they have raised will help us to continue to provide our outstanding care across Dorset, supporting our patients and their families where and when they need us most – in their homes, in a local hospital in our hospice, or over the phone”. 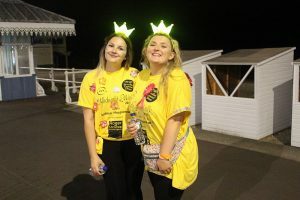 Many of the walkers had very personal reasons for walking for Weldmar, and included the names of those being remembered on the back of their special Midnight Walk tshirts. And one walker, Freja Arlow, chose to celebrate her 18th birthday with Weldmar and 600 women, who all gave a huge cheer for her when this was announced on the WessexFM stage. Weldmar Hospicecare is already planning the next Midnight Walk – and will be asking all the ladies who took part to suggest a new theme for the 2018 event.